How can I change text, link colors and background colors? How can I change patterns? Help! A character (or the entire alphabet of my language) is not displayed! Can category submenus in sidebar stay open? How can I	customize	the Facebook Box in the footer? How can I use my Twitter account with the Twitter Box in the footer? How can I change the position of the sidebar? How can I display a category in the horizontal top menu? How can I change payment images in the sidebar? How can I display products on the home page as in the demo site? How can I add banners? How can I add product sliders (eg: demo home page)? How can I add the manufacturers slider? How can I add one more level of subcategory in the category module? How can I add text modules to the sidebar and the main content area? How can I install a third parts module? How can I add special, featured and latest modules to the sidebar? How can I customize text (eg: phone number, footer titles, breadcrumb text, etc)? How can I set grid view as default in category page? Please, read the whole section before attempting to install this theme. It is recommended to always backup your system before making upgrades or changes! We marked with comments all the edited lines, so that if you have to replace those files (for example, when installing a plugin that overrides header.php or footer.php), you simply need to copy the edited lines inside your overriding files. We customized graphically all the existing OpenCart modules and we also created some new ones to add more features to your shop. Read carefully the documentation and follow the instructions: they will guide you throughout the entire installation process. ALDEMA STUDIO RECOMMENDS TO USE THIS THEME ON A CLEAN INSTALLATION OR EXISTING SHOPS WITHOUT CUSTOM CORE MODIFICATIONS! Since there are not heavy changes to core files, Basico 2.0 should need only small fixes even after major OpenCart version updates. You should not, however, upgrade your OpenCart version or install Basico on a new updated OC version unless we have previously checked files for compatibility and made changes if needed. Usually that takes only few days after the release of a new OpenCart version. Since we can not predict what would change in newer versions it's recommended to install Basico only on the OpenCart versions listed above or on our Themeforest page. Due to the fixes and improvements of this theme, Basico 2.0 is not compatible with previous Basico installations. If you already have Basico, you cannot upgrade it to version 2.0, so install a new OpenCart version. SUPPORT FOR PREVIOUS BASICO VERSIONS IS NO LONGER AVAILABLE. Step 1: Before installing this theme, get first a working OpenCart installation. Please read the official documentation and install OpenCart on your server. Step 2: Unzip the files included in the OpenCart_v.yourversionnumber directory of the downloaded zip file, copy and paste them into the OpenCart directory on your server. Step 3: Activate the theme. Log in the OpenCart administration panel and activate the theme from System > Settings > Edit > Store tab > Template. Select Basico from the list. Step 4: Install and activate the control panel. Differently from old Basico versions, we decided to not edit directly the OpenCart backend panel and we realized a control panel module. Log in the OpenCart administration panel and install it from Extensions > Modules > Control Panel > click on Install. Once the CP has been installed, click on Edit and then save the settings, even without making any changes. Since this is the first installation, the theme simply need some variables to be set. Warning: YOU CANNOT SKIP THIS STEP. Step 6: Basico is ready to be used. Just install modules, add categories, products, manufactures etc as you would in any other OpenCart shop. There's another way to install Basico: by importing a sql file into your database. This requires the access to the phpmyadmin panel of your database: generally it can be done from your host's website, after loggin in. Step 1: Unzip the files included in the OpenCart_v.yourversionnumber directory of the downloaded zip file, copy and paste them into the OpenCart directory on your server. 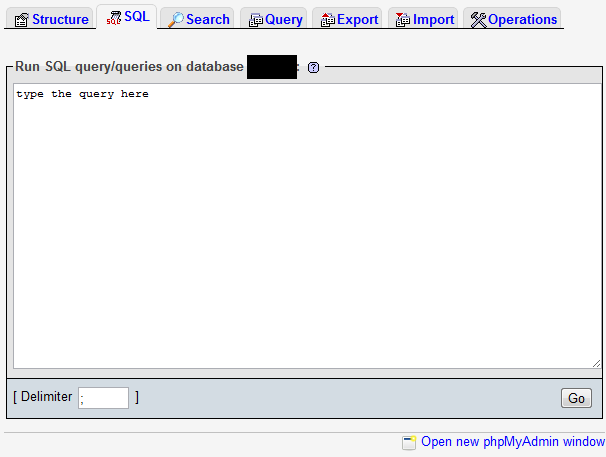 Step 3: Log in the phpmyadmin of your database, select the current OpenCart database and click on "SQL". Paste those queries inside the text box and execute them. 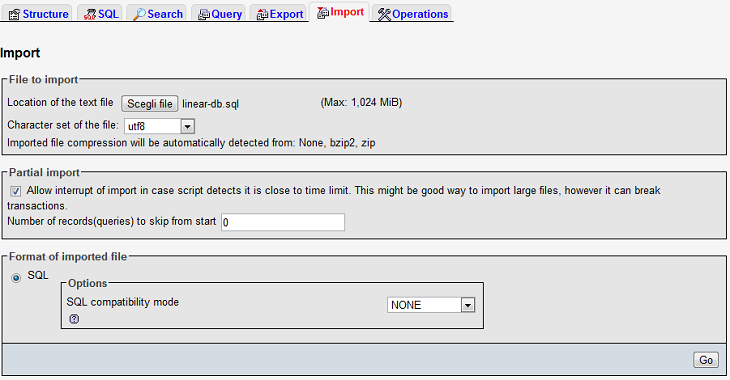 Step 4: Click on "Import" and select "Basico-sql.sql" included in the zip file. Go ahead and click on "Go" to import the file. Step 5: Basico is now ready to use. Obviously you'll see white images, since demo sites photos are not included. Do all the changes you need to setup your shop properly: rename categories, add new ones, rename, remove or add products and so on. All emails will be replied in no longer than 24-48 hours. Header, footer and content are auto-filled by the OpenCart's code, so don't worry about them. Content top, Column Left, Column Right and Content Bottom are for custom content: modules can be added here. Please notice that the sidebar is always in the Column Left, even when it's placed on the right side of the page. This brief "How To" guide will save you (and us) a lot of time by explaing how to make a basic customization of the theme. So please, before asking for help on Themeforest or via email, make sure you have read the following chapter. 1) HOW CAN I CHANGE TEXT, LINK COLORS AND BACKGROUND COLORS? It can be achieved from the Control Panel Module. Log in the OpenCart administration panel and click on Extensions > Modules > Control Panel > Edit. Use the input boxes below "TEXT, BORDERS AND BACKGROUNDS" and use the color picker to choose amongst available colors. 2) HOW CAN I CHANGE PATTERNS? Log in the OpenCart administration panel and click on Extensions > Modules > Control Panel > Edit. Find the line "Enable Patterns" and enable patterns by switching the select box on "Yes". Click on the square with grey borders near "Background Image" to open the Image Manager: select one of the existing backgrounds or upload a new one. 3) HELP! A CHARACTER (OR THE ENTIRE ALPHABET OF MY LANGUAGE) IS NOT DISPLAYED! Unfortunately, a font chosen by the developer cannot support every language and character. If you don't see your alphabet properly or it's not displayed at all (as it may happen to chinese, russian, turkish, vietnamese, etc, users) you need to disable Cufon. Click on Extensions > Modules > Control Panel > Edit and switch the Language Support to "Cufon Disabled". 4) CAN CATEGORY SUBMENUS IN SIDEBAR STAY OPEN? 5) HOW CAN I CUSTOMIZE THE FACEBOOK BOX IN THE FOOTER? 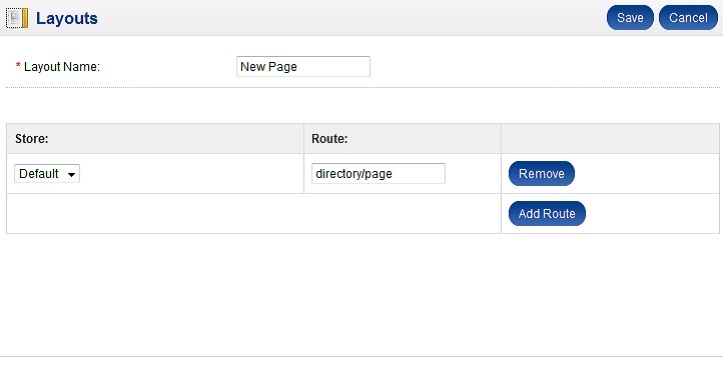 Log in the OpenCart administration panel and click on Extensions > Modules > Control Panel > Edit. Find the line "Facebook Account Id" under "Social Boxes". The number is the ID number of the current Facebook page account linked to the box: replace it with the one of your fanpage. If you don't know how to get your page ID, read this. Also, do not forget that the Facebook box works ONLY with Facebook PAGES and not with a common USER account. For example, if you have created a normal USER account for your shop, as if it was a real person, don't expect that it will work in the Facebook Box. Instead, create a fan page from that account and put its ID in the box. 6) HOW CAN I USE MY TWITTER ACCOUNT WITH THE TWITTER BOX IN THE FOOTER? 7) HOW CAN I CHANGE THE POSITION OF THE SIDEBAR? Log in the OpenCart administration panel and click on Extensions > Modules > Control Panel > Edit and use the select box next to "Sidebar Position", in the Sidebar section. As already written here, if you want to display a module in the sidebar you always have to set its position to "Column Left", even if you want the sidebar on the right. Just put each module in Column Left and then change the sidebar position from the Control Panel. 8) HOW CAN I DISPLAY A CATEGORY IN THE HORIZONTAL TOP MENU? Log in the Administration Panel and click on catalog > categories. Find the category you want to show in the top menu and click on Edit. Just make sure the "Top" checkbox in the "Data" tab is checked. 9) HOW CAN I CHANGE PAYMENT IMAGES IN THE SIDEBAR? Log in the OpenCart administration panel and click on Extensions > Modules > Control Panel > Edit and find the "Footer Payment Images" section. Use the select box to choose the number of images to display, then Save the settings. Re-open the Control Panel, click on the added payment images to open the Image Manager: choose an image or upload a new one and save the settings again. You can find more images here. 10) HOW CAN I DISPLAY PRODUCTS ON THE HOME PAGE AS IN THE DEMO SITE? It can be found in Extensions > Modules > Central Products Home. The latest module is called "Latest Content" and shows the latest products (their number is customizable from the "Limit" input box. This module works exactly as the featured one: type a product name inside the "Products" select box, and then choose a product from the autocomplete list. 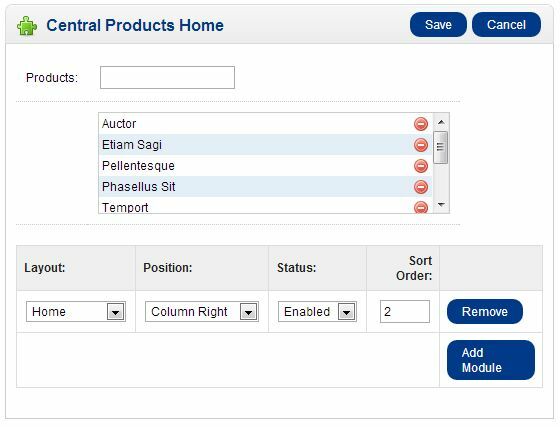 The Central Products Home is meant to be placed in "Column Right" or "Content Bottom". If you need to change the heading title, simply edit catalog/language/yourlanguage/module/bestsellerhome.php. 11) HOW CAN I ADD BANNERS? It's the normal OpenCart way to do it. First, open System > Design > Banner and click on Insert. 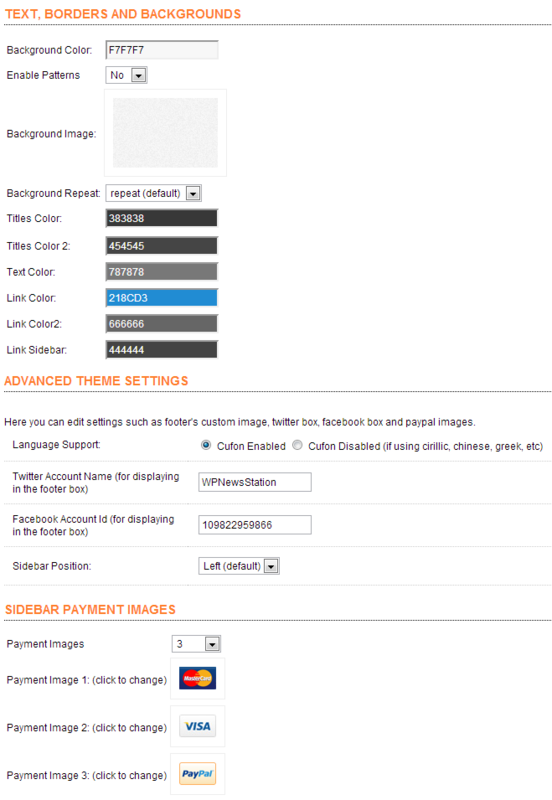 Add a banner name and click on Add Banner, give it a title, a link and select an image, then save the settings. You can use only one image for banner. After designing the banner, open Extensions > Modules > Banner and click on Add Module. 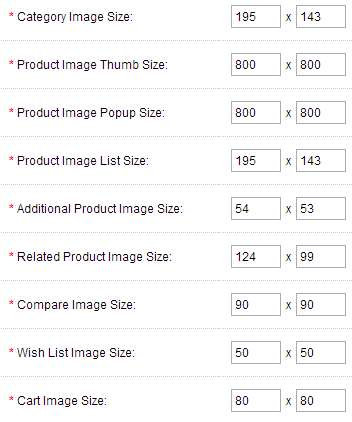 Select the added banner from the "Banner:" select box and fill the form. Banners can be added both in the sidebar (Column Left) and in the main content area (Column Right, Content Bottom or even in Content Top if you need to). In sidebar the width of the banner should never be more than 203px. For modules in the main content area, the maximum width of a banner is 695px. 12) HOW CAN I ADD PRODUCT SLIDERS (eg: demo home page)? In Basico there are five sliders: two with Nivo Slider (one with featured products, the other with latest products), two without Nivo Slider (one with featured products, the other with latest products) and a fifth standard OpenCart slider. To add the Nivo Slider, open Extensions > Modules > Slider with Nivo (featured products) or Slider with Nivo (latest products). Add a new module and, for the one with featured products, select some products. Then, save the setting. For the latest slider, you should first create a new banner: open System > Design > Banner and click on Insert. Add a banner name and click on Add Banner, give it a title, a link and select an image, then save the settings. Since product sliders are modules you can find them in Extensions > Modules. To add the Slideshow slider, open Extensions > Modules > Slideshow. Add a new module, select the banner previously created and fill the whole form. Then, save the setting. You also need to copy the content of "catalog/language/english/module/" and "admin/language/english/module/" in the same paths of your new language. If you don't copy those files, Basico will give you the annoying error "Could not load language etc etc". If you have installed a new language and some elements still appears untraslated, open the file "catalog/language/yournewlanguage/basico.php" and manually translate the content you want, then save the file. If the page you're looking for is not within the "layout" select box (for example "product/search"), click on "System > Design > Layout" to add a new layout position. Then click on "Insert", type a layout name and click on "Add Route". Type the page's route and click on "Save". Yeah, we've been asked even this! The bestseller module is empty because... well, you haven't sold a product yet! And this is how the featured module works. We suggest you to read carefully the OpenCart documentation. 16) HOW CAN I ADD ONE MORE LEVEL OF SUBCATEGORY IN THE CATEGORY MODULE? 17) HOW CAN I ADD TEXT MODULES TO THE SIDEBAR AND THE MAIN CONTENT AREA? Click on Extensions > Modules >Text Widget. Add a new module, type the title and the content of the widget, then select a layout amongst Column Left (if you want it in the sidebar), Column Right and Content Bottom. The widget dimensions will adjust automatically. 18) HOW CAN I INSTALL A THIRD PARTS MODULE? Obviously we cannot provide assistance for third parts modules. However to guarantee a better compatibility with such products, we decided to limit core files editing. There are some changes only in catalog/controller/common/header.php, catalog/controller/common/footer.php and catalog/controller/common/column_left.php. If you're going to install an OpenCart plugin that may replace those files, before installing additional modules make first a backup of header.php, footer.php and column_left.php. The edited lines are wrapped around php comments, so all you need to do is copy those lines inside the replaced files, at the same position. It may be caused from the Twitter API. For more information read here. 20) HOW CAN I ADD SPECIAL, FEATURED AND LATEST MODULES TO THE SIDEBAR? From the administration panel, click on Extensions > Modules > Special/Featured/Latest. Dimensions should always be both of 52px x 46px. Set "Column Left" as Position. 21) HOW CAN I CUSTOMIZE TEXT (eg: phone number, footer titles, breadcrumb text, etc)? 22) HOW CAN I SET GRID VIEW AS DEFAULT IN CATEGORY PAGE? Restart your browser and clear your cache to see the changes. A special thanks also to the creators of used jquery plugins.